Every parent that has young children in school or nursery has to keep on top of the essential information that they receive from where their child attends. Parents require a reliable form of accessing this information. Old-fashioned letters and notes are lost or never quite make it into a parent’s hands. Staff, with good intentions to speak to a parent, may find themselves pulled in different directions when parents arrive and important information is never relayed. This app is the parental part of a solution to use modern technology to solve these problems. Any app such as iCare Kids needs to be considered in two parts. The first asks whether the app provides the features that the app needs to offer to be useful. The second asks whether the app is pleasant and easy enough to use for parents to actually feel willing and able to rely on it. The information that the app is able to provide is thorough and relevant to its role. Schedules, menus, and new events keep parents informed about their child’s coming week. Messages, photo galleries and various reports let them know about their own child specifically and ensure that communication between staff and parents is not dependent on the chaotic few minutes when just a few staff need to speak to many parents at the end of the day. These features would count for little if they were hidden behind complex and confusing menus but, fortunately, they are not. The app's aesthetics and presentation are both friendly and welcoming. From the home page, it is easy to access the relevant sections. On tablets and phones, everything is clear and readable. Navigation relies on common interactions, so parents who use other apps will not struggle to use this one. Some information needs to get through quickly and not require a parent to search for it. As long as parents enable notifications for the app, the nursery or school can send messages that immediately demand attention from parents. There are a few rough edges to the app. None of these interfere with the usefulness or usability of it but they could make parents feel that it is not quite the slick experience that they have been promised. Accessing the information about the app shows the text broken up with its HTML formatting tags. When the app accesses new data, it at first shows ‘data not found’ before populating the data once it is loaded. From a user point of view, it is tempting to immediately cancel out of the page once the user has been told data has not been found. It would be far better to present a loading notification to avoid this, especially as on a slow connection, the message could display for a few seconds. One issue with providing information via an app is that parents who lose a phone or don’t have one are excluded but fortunately this app has a generally available web app too. From any device or computer, parents can log on to the exact same information as they could get on their iOS or Android devices. Essentially it is nurseries and schools that need to assess this app for parents as it is they that will embed its structure into their administrative procedures. Combined with the rest of the package that they will need to subscribe to, they can rest assured that parents will welcome the convenience and reassurance that this app provides. 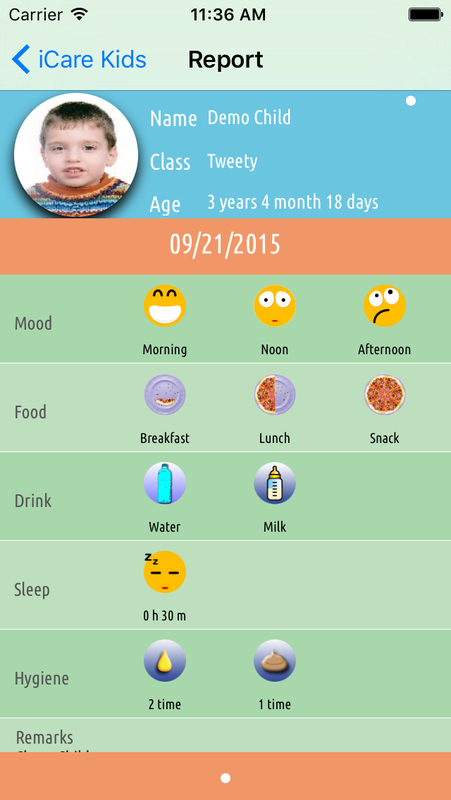 iCare-Kids is a mobile application designed for parents who have children in nurseries. iCare-Kids acts as a dedicated social networking solution which helps connect parents and nurseries with an easy to use and attractive tool.